Our Transition Years spent two action-packed days at Carlingford Adventure Centre, making new friends and enjoying a wide variety of sports and activities. Despite the early morning starts the students enthusiastically participated in zip lining, laser tag, hiking and many water sports. A wonderful time was had by all. This week Abby, Holly and I undertook work experience at the Concern offices. It was a totally different experience to anything we had done before. We were first introduced to the other participating students from all over Ireland. We had the opportunity to hear about the work that Concern do and listened to talks given by people working in a variety of areas such as fundraising, emergencies, social media, journalism, gender equality and malnutrition. We also learned about Concern’s work overseas in the global south and we got the opportunity to Skype with one of the workers in Malawi and ask her questions about her work and life there. It was amazing for me to see how much thought and effort Concern put in to how they spend their money and how they can improve the lives of people living in the global south. I was very pleased to learn that our money is spent so well and would like to learn more about the work of Concern. In the future I would love to work for an organisation such as Concern because I could really see the difference it makes. I am delighted that we had the opportunity to study Development Education in Transition Year and learn more about global issues. Thank you to all the staff at Concern! On Thursday the 8th of December, the Transition Year students along with the RE Department held a Christmas event in aid of Traidcraft. The assembly hall in Maryfield was transformed into a wonderful Christmas market for the entire school community to enjoy. Students and teachers could buy some beautiful Fair Trade craft gifts for their loved ones, or have a coffee or hot chocolate in the café area. They purchased cakes, had their faces painted, bought raffle tickets and sang along with the Transition Years who entertained them with Christmas songs. Traidcraft is the leading UK fair trade organisation, dedicated to fighting poverty through trade. All the products sold are ethically and environmentally produced by farmers and artisans in many countries throughout the developing world. Fair trade means that the price we pay for products ensures fair remuneration for producers. They can then afford life’s essentials such as food, education and healthcare. Traidcraft is founded on Christian principles. It seeks to live out the Christian faith through its mission to fight poverty through trade. It is both a Trading Company and a Development Charity. Traidcraft helps poor producers to work their way out of poverty. By developing their skills and their knowledge, Traidcraft helps them achieve their God-given potential. It is a simple and effective way to respond to Jesus’ command for us to love God and serve the world. 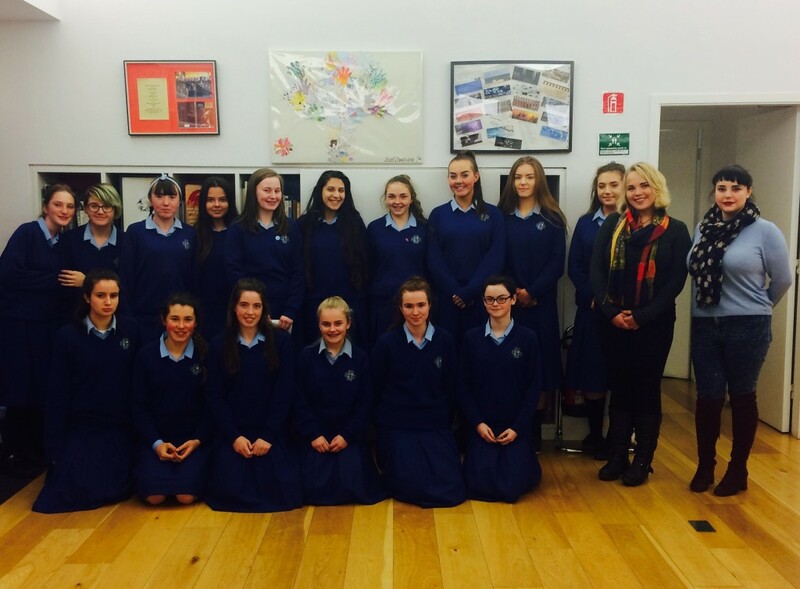 The Transition Year students hosted an amazing event and raised a grand total of €4,010 for their efforts. They would like to thank all staff and students who supported the event. A special thank you also to the following teachers – Ms. McAuley, Ms. Kelegan, Ms. Mellon and Ms. Seery for all their work on this project. Chuir grúpa scoláire ón idirbhliain tráth na gceist ar siúl sa halla ar an 25 Samhain. Chum na scoláirí seo na ceisteanna go léir, rinne siad taispeántas deas PowerPoint agus ghlaoigh siad amach na ceisteanna go líofa. Bhain gach duine an-taitneamh as an ócaid agus tá moladh mór tuillte ag na scoláirí iontacha a chuir an tráth na gceist seo ar siúl. 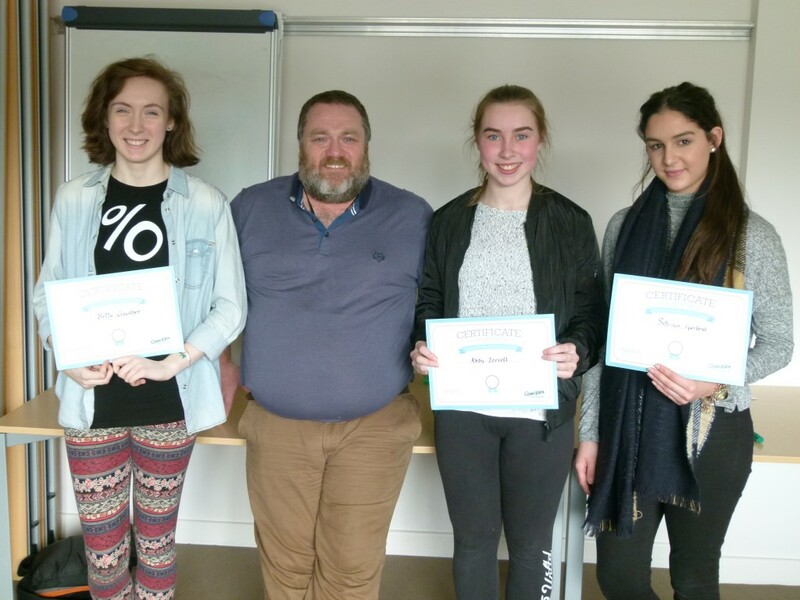 Transition Year students attended a creative writing workshop on Monday 21st November in Fighting Words Creative Writing Centre. The group had a chance to compose a story as a group and individually, and worked with a team of volunteer writers to develop their writing style. Thanks to all at Fighting Words for a wonderful afternoon! Transition Year students paid a visit to the ‘Zeminar’ event which took place recently in the RDS. ‘Zeminar’ is a new social enterprise which brings together the various partners involved in the wellbeing of young people and examines the issues surrounding their academic and personal development. The event consisted of a variety of stands representing organisations and activities that promote positive mental health. The highlight of the day was a presentation given by Bressie. He connected well with his audience by speaking honestly and openly about his own life-experiences and sharing his story about dealing with very real issues such as anxiety and depression. From the 6th to the 9th of September Transition Year students attended a very enjoyable dance and drama workshop. This workshop is always an excellent start to TY with students making new friendships and connections in an extremely sociable environment. The students learned a number of dance routines and acted out excerpts from a selection of musicals. The students really looked forward to attending the workshop each day and used up plenty of energy while having fun. The Transition Year trip to Carlingford Adventure Centre was once more a resounding success. The school classroom of Maryfield was replaced by the great outdoors of the shores of Carlingford Lough, Maryfield students making this transition seamlessly. Students participated in activities and challenges that many had never before encountered. Decided favourites were kayaking and zip-lining. The overnight trip consolidated old friendships and built new bonds for the year ahead.